It's Not Work, It's Gardening! : Ambushed again! 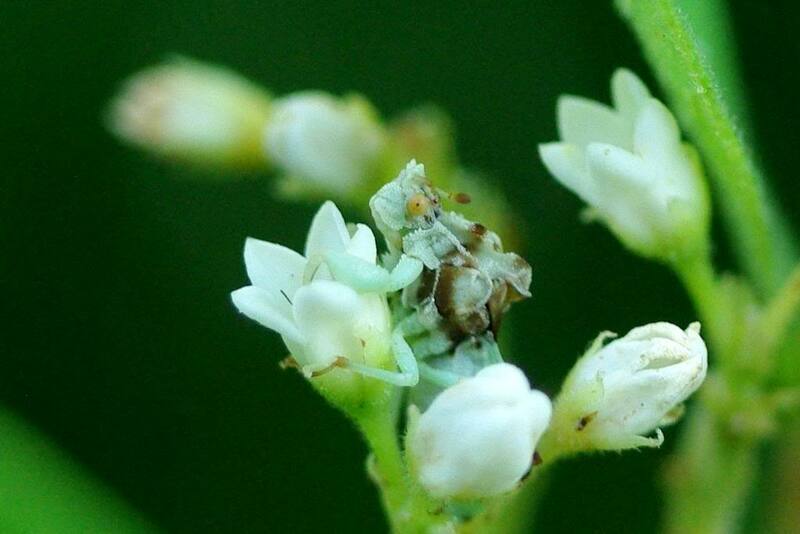 Earlier this year I posted about an ambush bug that I discovered in my veggie garden. 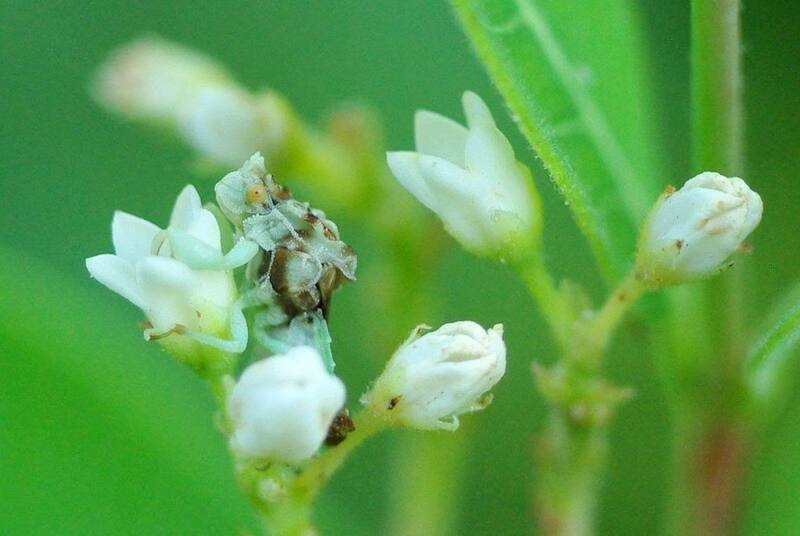 Before that post I had never heard of ambush bugs, and I was really fascinated by this "new" critter. Guess what I found the other day? Yes, another ambush bug! 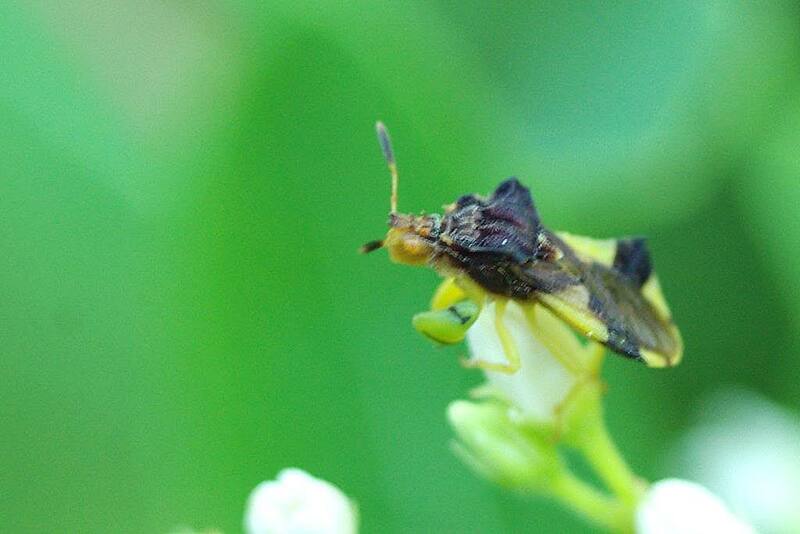 I spent quite a bit of time watching it and taking photos, and I have to say that ambush bugs are quite boring. They pretty much just sit there without moving. Forever, as far as I can tell. This particular guy was on the exact same flower for at least three days in a row. As far as I can tell, it hadn't moved at all. I didn't prod it, but it paid no attention to me as I towered over it, never flinching. I like cool insects like that, because I need a lot of time to get decent photos most days. Those skittish bugs (like most butterflies) that only let you get three feet away and then rocket out of there, over and over again, well, they're just frustrating. 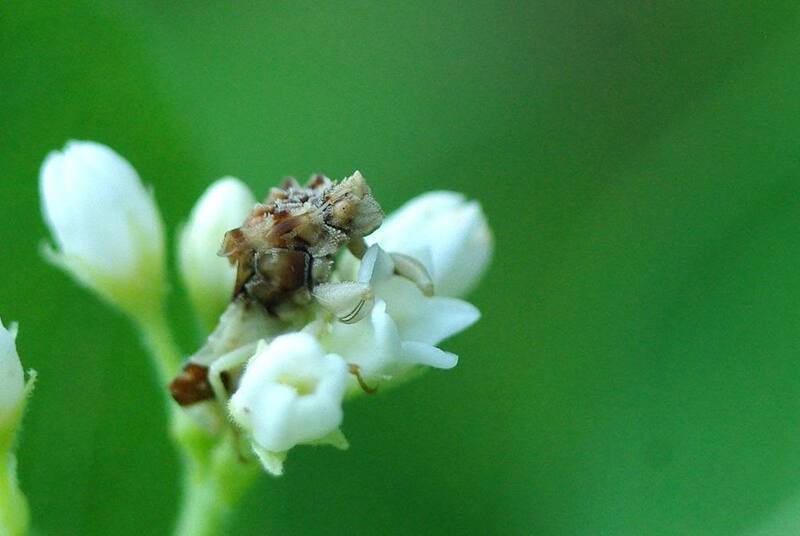 Ambush bugs don't care. They're waiting to ambush some unsuspecting fly I expect. Very patient. It only stayed for a few seconds before taking off again so I didn't get a chance to focus correctly, but I got enough of a look to be amazed: it's another species of ambush bug! Okay, that looks like a different species from these other two. 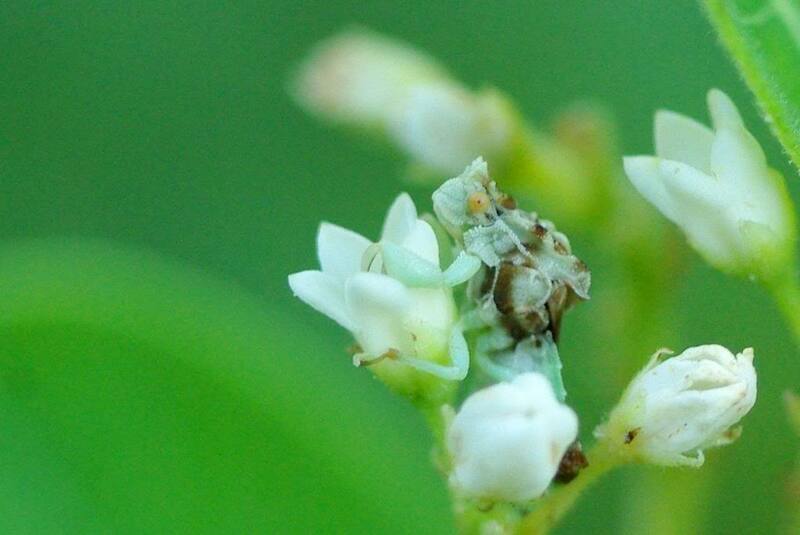 Three different ambush bug species in my small veggie garden? Amazing! But wait... what's this on another flower just three feet away? 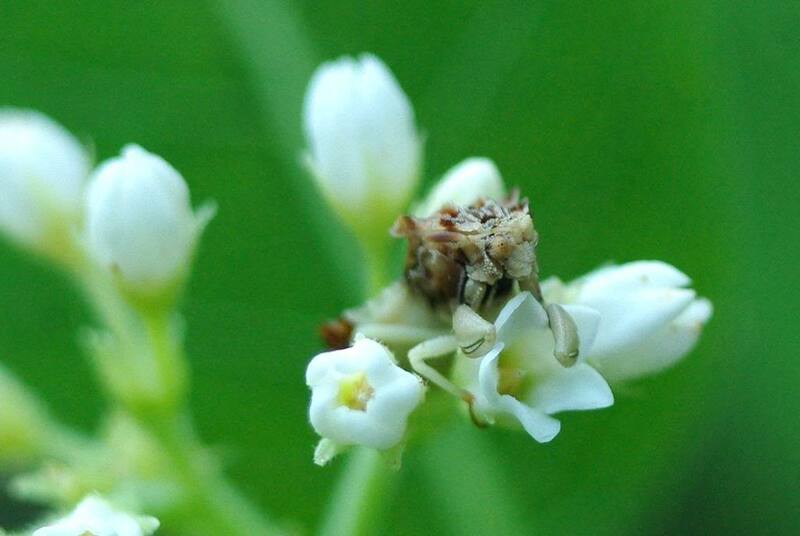 It's another ambush bug! Is this a fourth species? It must be, right? It's got completely different coloring than any of the other three. I think this is probably the most attractive of the bunch though. Isn't it beautiful? Very exotic -- it doesn't seem like something I'd find in my suburban St. Louis garden. I know it's hard to tell from these photos, but these insects are small -- less than 1/2 inch, maybe more like 3/8 inch (about 10mm). 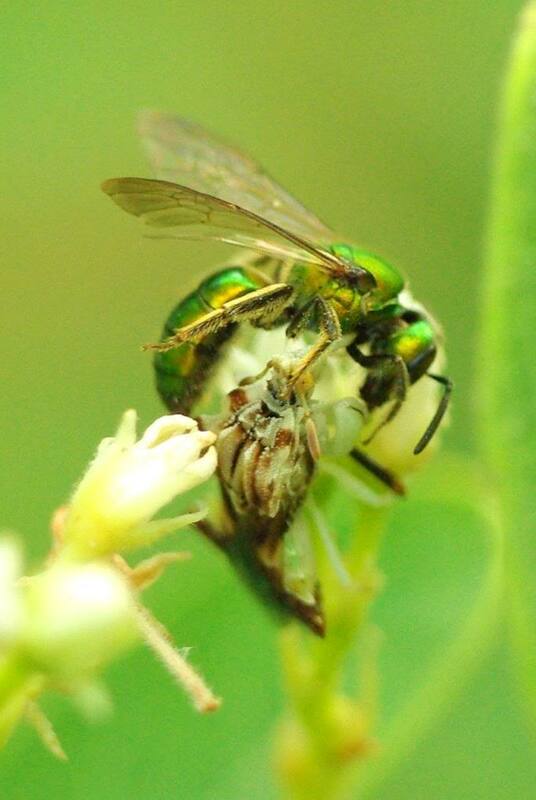 Why is that little green bee so close to the ambush bug? Oh. I suppose you tend to stay pretty close when you've got a tube stuck into your body. 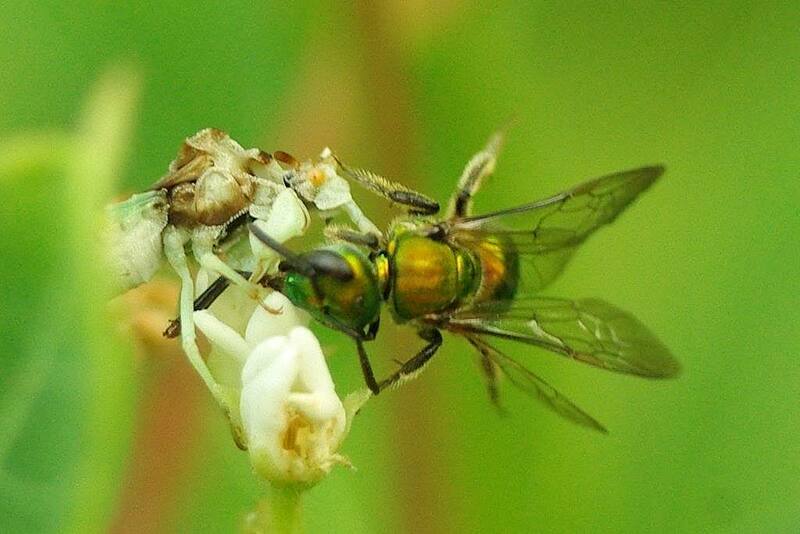 The ambush bug pushes its mouth tube into its prey, like a stiff plastic straw into a juice bag. 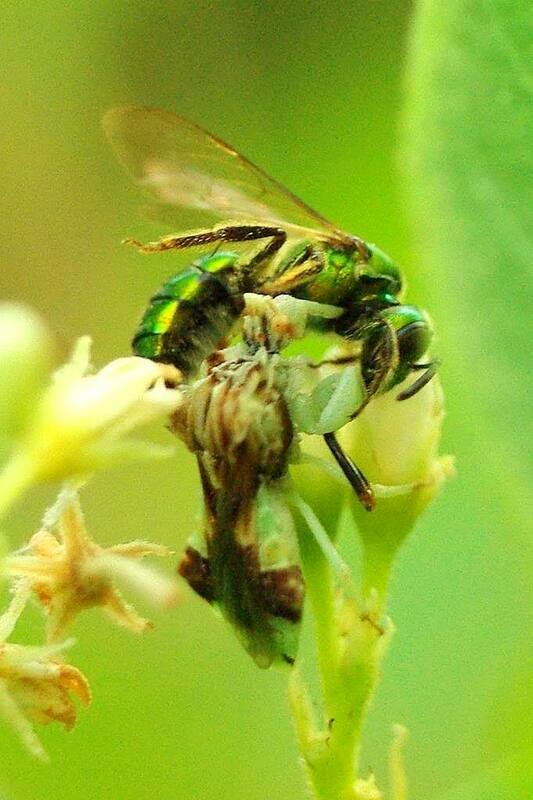 The ambush bug is no mantis, but the bee doesn't stand a chance. 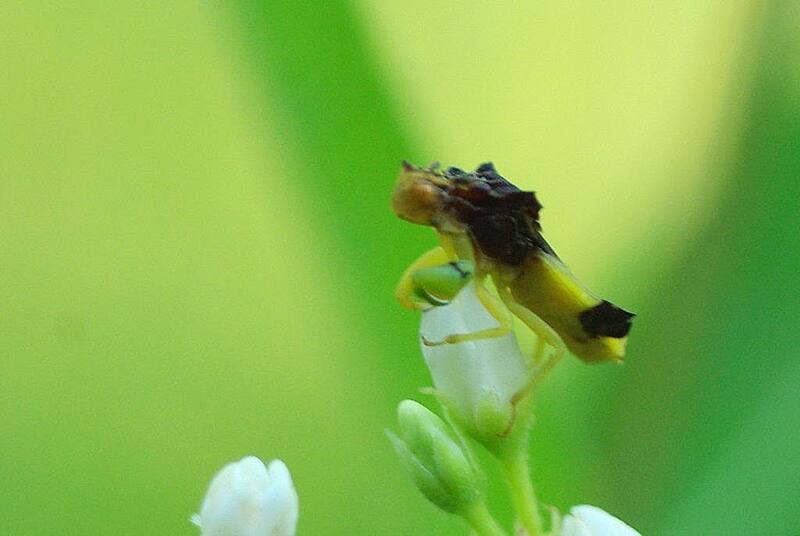 I think I like the ambush bugs better when they're being boring. Still, that's Nature for you -- these scenes must play out dozens or hundreds of times each day in my yard, right? 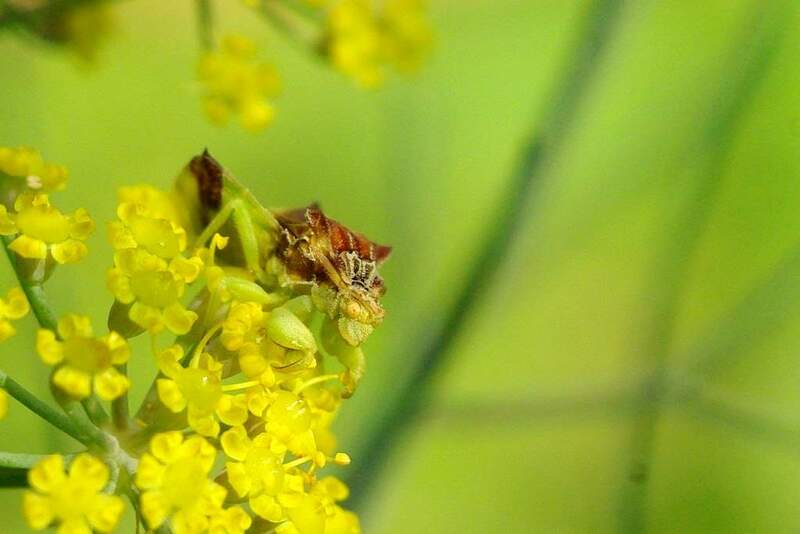 So a couple of months ago I didn't even know what an ambush bug was, and now I've got who knows how many beautiful and interesting species sharing my garden. What I forgot to say was that I think these guys look like tiny smiling chameleons in the first few photos -- their deadly sucking tube is folded under and looks like their lower jaw. I really enjoying seeing photos of all your bugs! It teaches me to slow down and look for and at the little critters all around us. Uros: look at my "about me" page for camera info. Interesting. 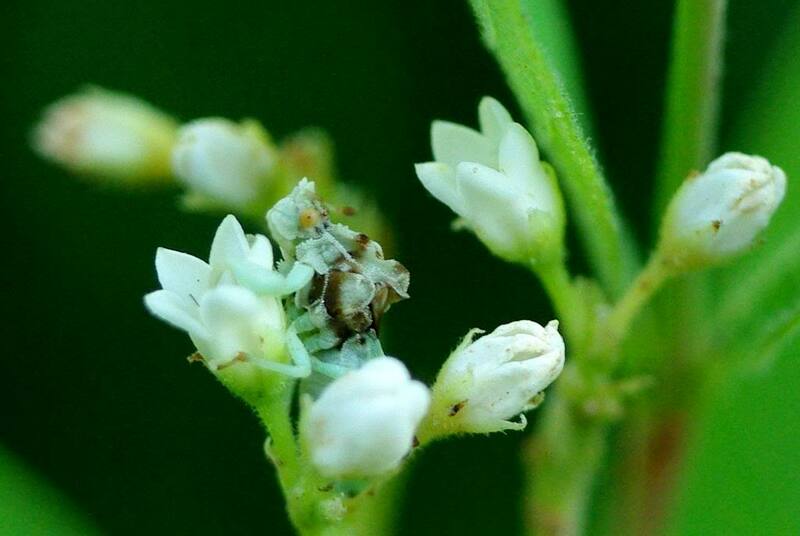 I've never heard of ambush bugs before. The first one looks like a multi-legged frog.